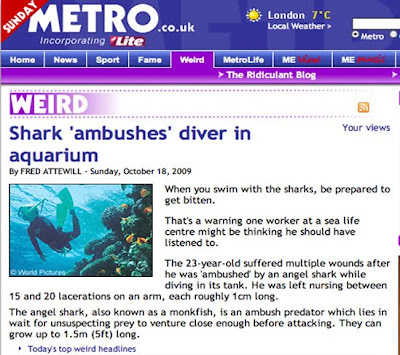 After a Sea World employee in Scotland was bitten by a shark in an aquarium yesterday this UK based website labeled the story as “weird”. Obviously they either don’t know what a shark is, or do not label stories that appear on their website under the title “not-surprising”. So, reason 3788 that sharks blow- you don’t even have to be in the ocean to be bitten by one. Yes, you would think you are relatively safe from shark attacks if you were either A) in the United Kingdom, B) at a Sea World or C) at an aquarium, but it turns out none of that is true. And apparently, this particular shark- an “angel shark” or “monkfish” is known for ambush attacks, where it basically hides under something till its prey (read: anything it wants to bite) comes close enough for it to spring. Apparently, they grow close to 5 feet most of the time and even though they can look like a ray, trust me it is a friggin’ shark and will kill you. The good news is, these sharks take a long time to reproduce and a substantial time to mature once they are born, so if we kill a bunch of them quickly- with bombs or Sarah Palin in a “water-plane”, we have a good shot at wiping them out! RECORD SCRATCH! The Wildlife and Countryside Act of Great Britain is protecting these killers? Unbelievable!